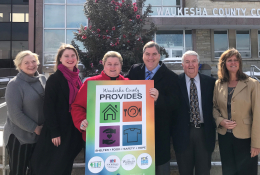 Now through March 14, the Waukesha County Community Foundation is proud to again host Waukesha County Provides, a fundraising initiative founded in 2016 to support our four county-wide basic needs agencies: The FOOD Pantry Serving Waukesha County, Hebron House of Hospitality, Hope Center, and The Women’s Center. The FOOD Pantry of Waukesha County provides food, hope, and dignity to county residents in need, and advocates to increase awareness of hunger through community partnerships. We envision a future without hunger in Waukesha County.